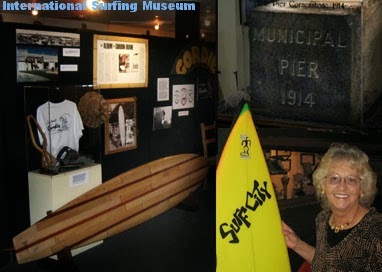 "[The] International Surfing Museum was founded several decades ago by a woman who's never surfed. In fact, Natalie Kotsch (pictured with a rare electric surfboard) came from a spot in Canada where there really wasn't any surfing. She recognized this incredible beach vibe and a welcoming spirit that made her feel happy in Huntington Beach, and she got caught in a fever that snags many who live in beach areas around the globe. 'You don't have to surf to love watching the sport,' said Kotsch. ...Thanks to her efforts, many of the great surfboards and local history have an opportunity to be preserved in a huge, cataloged collection that rotates in the museum." Memorial plans have not yet been announced. To leave a card for the family, stop by the museum or send to Family of Natalie Kotsch, 218 7th St., Huntington Beach, 92648. The family is asking for donations to the museum in lieu of flowers.